An interesting comparison between ads for the same property nearly 100 years apart reveals some interesting contrasts in the way realtors approached prospective buyers. 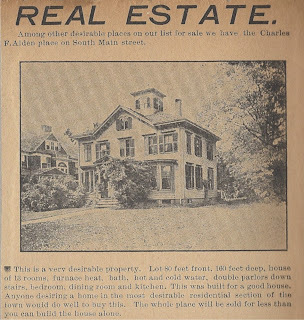 The house in question, the James M. Coombs House at South Main Street, was advertised for sale by Sullivan & Sullivan realtors in November, 1914. While the agency's pitch stressed the durable construction of the house ("this was built for a good house"), it also highlighted the modern amenities such as "furnace heat" and hot and cold running water which were not then universally available in homes. In an interesting reversal, the modern advertisement by Uptown Realtors of Middleborough emphasizes the home's unique past and "Victorian elegance", drawing attention to building features which are no longer commonplace in modern houses. The house was built in 1877 by James M. Coombs, editor of the Middleboro Gazette. "Real Estate." Middleboro Gazette, advertisement, November, 1914.